Mastech HY1803D is highly stable. high quality linear regulated power supply with its output continuously adjustable at 0-18V DC and 0-3A. 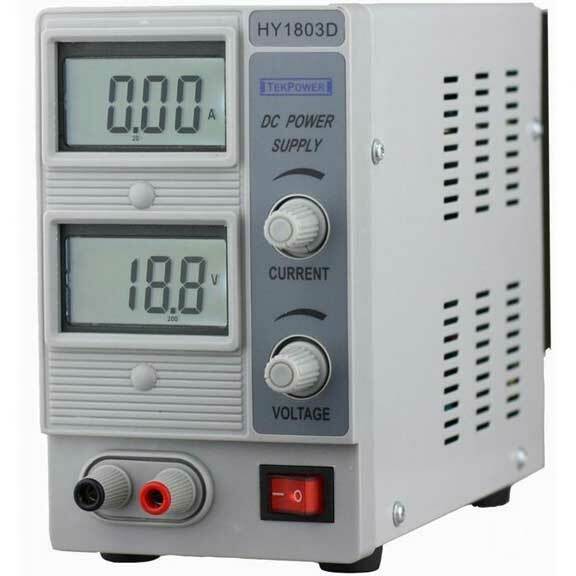 HY1803D variable power supply comes with 2 LCD displays. providing accurate readout for the voltage and current values. The Masteh HY3003D DC Power Supplies are high quality. general-purpose DC Power sources. The power supply provides 0-30 volts dc output adjustable with both coarse and fine controls for precise settability. The current output of Model HY3003D is 0-3 amps with excellent current settability and meter resolution. Mastech Power Supply HY3005F-3 is a regulated power supply with triple outputs. This high quality linear power supply has three outputs: two outputs are continuously adjustable at 0-30V DC and 0-5A. and the third output is fixed at 5V DC and 3A. Regulated power supplies are used when you want to adjust the output. The regulated power supplies with LED displays provide accurate readout for the voltage and current values. You can order these regulated power supplies at SF Cable. We have Regulated DC Power Supply Mastech HY1803D Variable Single Output 0-18V @ 0-3A, Regulated DC Power Supply Mastech HY3003D Variable Single Output 0-30V @ 0-3A, Regulated DC Power Supply Mastech HY3005F-3 Variable Triple Output - 2 Variable: 0 - 30V, and other products available at SF Cable. We source our products directly from ISO 9001-2000 registered manufacturer to cut the middlemen costs and offer the products to you at minimal costs. We also provide lifetime technical support on our products.